Launching on November 26 is an annual invitation to encourage the buy-side (asset managers, institutional investors, family offices, etc.) and the sell-side (typically brokers and broker-dealers) to join some of the world's most prestigious institutions by evaluating their service providers and other vendors at ServiceMatrix. Freely available at the ServiceMatrix app are much of the latest, high-level results – based on 250+ responses and 6000 individual ratings. No subscription or vendor evaluation is required to view these results. Firms can gain quick access to a more detailed, complimentary report on vendors' strengths and weaknesses, with actionable data on where to drive improvement. Simply pick an area to examine and evaluate your vendors on the touchpoints that matter. ServiceMatrix eliminates the vendor bias in conventional surveys, which rely on service providers managing client participation. Almost without exception, vendors came to be highly selective in which clients were invited to get involved in such surveys – leading to a loss of credibility and subsequent withdrawal by vendors from active participation. 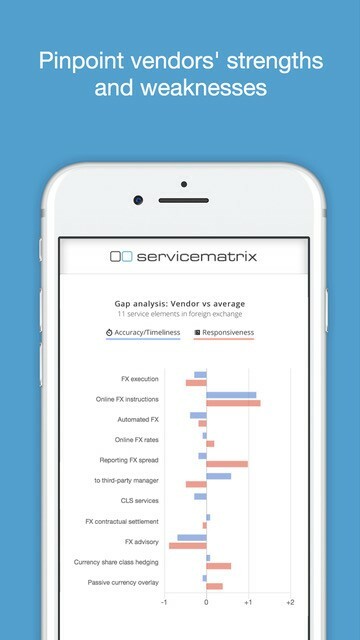 In contrast, ServiceMatrix has buy- and sell-side firms engaging directly, rating all their vendors and defining the areas examined and measures applied. Already, 25+ vendors have been evaluated, with 12 qualifying for the reports to date, while results have been published for a total of 24 service categories. "We greatly appreciate everyone's involvement at ServiceMatrix and especially those who are contributing evaluation of their vendors," says Andy Stephenson, Founder of ServiceMatrix. "The platform is fast-becoming the standard for tight assessment of how vendors are serving their clients, providing guidance on Request for Proposal (RFP) selection and binding vendors to work with their clients on driving improvement."